Select the Admin tab in the top navigation menu. Select the Services -> Backups menu item. Click the “New” button to configure a new backup set. You can also edit or delete an existing backup set in the list of available backup configurations. Define a unique name for the backup set in the “Backup Key” field. Configure how often the backup should run using a cron expression in the “Cron expression” field. Specify a directory for the backup file in the “Backup Directory” field. Specify which repositories should be included or excluded by dragging and dropping repositories between the “Included Repositories” and “Excluded Repositories” lists. 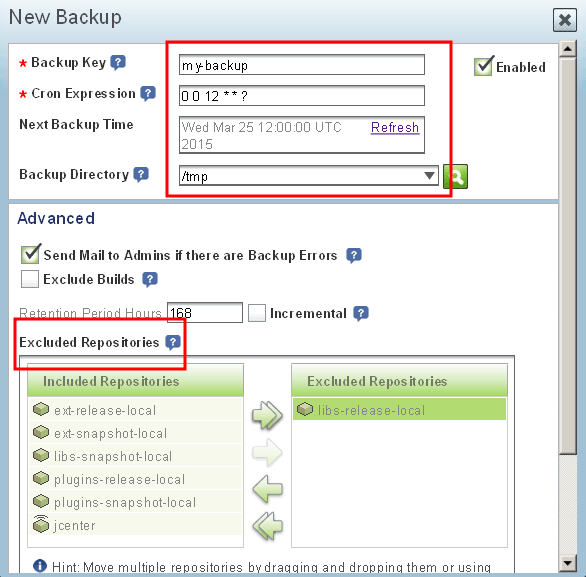 Click the “Run Now” button to immediately run the backup, or the “Create” button to save the backup for later execution. Select the Import & Export -> System menu item. Browse to the backup file and select it. Click “Import” to restore it. NOTE: The steps above will delete all existing JFrog Artifactory Open Source content and replace it with the content of the backup file.